My husband and I both grew up using Tiger Balm for muscle aches and pains. However, after learning that it's a petroleum based salve, I started looking around for other muscle ache formulas to try. It's not that Tiger Balm doesn't work, it's just that I don't want to deal with the horrible side effects from petroleum jelly. Petroleum jelly is not absorbent in and of itself. It does seal the skin, so that the other ingredients can be fully absorbed, and not accidentally rubbed off. This sounds like a good thing, but what it does is clog the pores so that there is major build up which can lead to acne and other skin conditions. It also prevents toxins from being released from the pores. This can lead to toxicity problems, including kidney and liver problems down the road. However, petroleum jelly is also closely linked to various cancers, including breast cancer. Because of this, and it's high chance of being corrupted with polycyclic aromatic hydrocarbons (PAHs), which are major endocrine disruptors, it's use in beauty products is banned in several countries. And all of this is without touching on the fact that petroleum is derived from crude oil (along with paraffin oil, liquid paraffin, and mineral oil), as if we needed another reason to avoid the stuff. So now that we know why I try to avoid Tiger Balm, lets get on to what I found that works in it's place. It's a lineament called Dit Da Jow. There's a bonus as well, while Tiger Balm works wonders on sore muscles, it didn't work well for bruising. However, Dit Da Jow does. It seems that everyone who practices martial arts has their own recipe, often passed down in their family. After much research, I came up with this recipe that works well for my family. Now this is, traditionally, a Chinese formula. However, I think several American herbs increase the effectiveness of this formula, so you will see some of those in this recipe. Also, since this is a Chinese recipe, I will list the Chinese name for the herb as well as the English one. Dit Da Jow is great to rub on sore mussels after a workout, on arthritic joints, and to relieve the pain of rheumatism. This lineament helps to reduce pain and swelling, increase circulation, and speed up healing of bruises, wounds and other injuries. Dragons Blood (Xue Jie) helps to stop bleeding, promote the healing of wounds, and reduce pain. This herb is great for bruising. Frankincense (Ru Xiang) has been used in Chinese medicine to heal injuries and pain due to Blood or Qi stasis. It works best when used with Myrrh as they have a synergistic relationship. Myrrh (Mo Yao) invigorates the blood, prevents gum disease, and alleviates pain. It works best when used with Frankincense as they have a synergistic relationship. Arnica (Shan Jin Che) is highly toxic, and not suitable for internal use. However, many herbalists and holistic practitioners maintain that this is one of the best herbs to speed the healing of bruises. It also helps soothe pain associated with trauma and arthritis. Plantain (Che Qian Zi) is used all over the world for quite a few issues. It's known best as a wound herb, however, and works well to reduce inflammation and speed healing. Comfrey (Comfrey) has been traditionally used to heal wounds, sprains, and broken bones. It's excellent at speeding the healing of these injuries and reducing inflammation. Nettle (Xun Ma) helps to purify the blood, but it's also packed full of Vitamin K which helps stop bleeding and speed the healing of wounds. Calendula (Jin Zhan Ju) is similar to Arnica, but much more mild and safe for internal use. It's a great wound herb and helps speed healing as well as reduces inflammation. Angelica (Dong Quai or Dang Gui) is considered to be a cure-all blood purifier. It helps to move the blood and aid recovery, especially when dealing with wounds and sores. Clove (Ding Xiang) along with it''s many other amazing properties, clove helps ease muscle cramps and reduce inflammation. Turmeric (Jiang Huang) is one of the best known anti-inflammatory herbs in the world. It also helps speed the healing of sprains, wounds, and bruises. Dandelion (Pu Gong Yin) is super high in Vitamin K which helps stop bleeding, improve bone mass, and limits neuronal damage in the brain. It's a great tonic for blood, skin, and digestion. It's also used in Western herbalism to help soothe sore muscles. Cayenne (La Jiao) helps improve absorption of this formula, but it also reduces inflammation and is a mild pain reliever. Combine herbs in a 16oz mason jar. Cover with vodka. Label and leave in a dark, cool place for 6 weeks to 6 months. Make sure to shake it once a day. 6 weeks is minimum, but the longer you let it sit, the stronger the lineament will be. This recipe is not for internal use. Rub it on your sore muscles and/or bruises. Make sure to rub away from your heart to help break up stagnation. 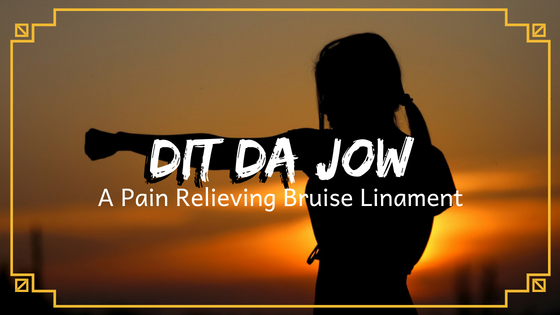 I hope this Dit Da Jow recipe works for your aches and pains. If you have any questions or comments, please leave them below!